A bonsai tree is a delightful and entertaining plant to have in your home or around the office. Like most plants, the bonsai does require proper care and attention, however. That should not be intimidating, though. For instance, the bonsai tree has very specific watering requirements that plant owners need to adhere to. More specifically, the tree needs to be watered once a week by immersing the entire tree in a bucket or basin filled with water. Once you notice air bubbles rising to the surface, the bonsai has had its fill of water for the time being. Many homeowners prefer to have a bonsai tree in their house due to the calming effect trimming the tree can have. The goal of pruning is to maintain the proper shape while the tree grows. Furthermore, by pruning the top growth, you successfully ensure good growth elsewhere on the tree. Bonsai clippers are a worthwhile investment if you intend to prune bonsai trees as a hobby. Please note, you should never use plain scissors on your bonsai. First off, decide which branches need to be trimmed to maintain a natural or desired design. When it comes to cutting, there are a few careful steps you must consider. For example, like any plant, the bonsai will grow weeds around its base. Gently uproot any weeds you notice immediately, being as careful as possible not to damage the roots of the tree. The younger the tree, the more susceptible it may be to root damage. Next, decide on your desired canopy size. Begin by pruning and trimming the top branches and outer growth. Do not be afraid to snip the top, as it allows everything else to distribute evenly. Then, defoliate the tree to remove any old leaves and encourage new growth. 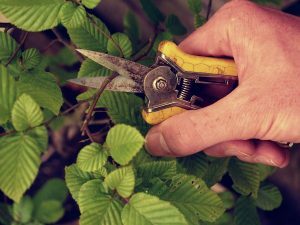 For more tips on trimming and pruning a bonsai tree, contact Blooms Landcare at (817) 688-5352. We would be happy to offer advice on your plants!